The humble carrot, familiar fare for Bugs Bunny and armies of school children, can be a dangerous, even lethal, snack for a small number of people. Heating the carrot, however, can render them harmless to the allergic, according to a recent study. But how could a little heat turn a vegetable from deadly to delectable? And how can a wholesome carrot be dangerous in the first place? The carrots we buy in grocery stores are certainly not poisonous. 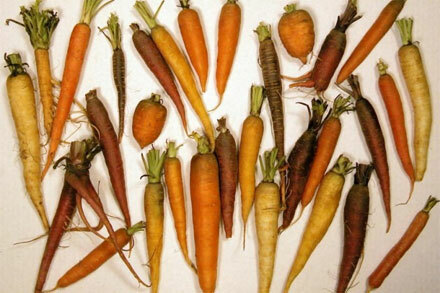 The carrot, native to Afghanistan, is a root that has been grown and eaten for thousands of years. The typical orange variety was developed in 17th century Holland. Carrots are a good source of carotene, the compound that our bodies convert into Vitamin A. This innocuous, nutritious vegetable is nonetheless dangerous to those people whose bodies react to it as a foreign invader. These people have immune systems that respond to carrots in ways that are usually reserved for illness-causing germs. No one really knows why this happens, but food allergies are becoming more common and seem to be on the rise in the industrialized world. The cause of this proliferation may be excessive cleanliness. Today’s western children are exposed to fewer microbes not only because of the lack of dirt and germs in the foods they eat, but because they are more socially isolated than children in developing nations. Research has shown that children who attend daycare have fewer allergies than children who remain at home. Furthermore, both children and adults use antibiotics to combat microbes in their environments. In sterile environments, immune systems lack enemies, and may attack food proteins as if they were germs. Our bodies are protected from germs by the antibodies that constantly roam the blood system looking for foreign invaders. For allergic people, antibodies target food proteins moonlighting as allergens. When antibodies detect an allergen, a reaction occurs. The body’s response to an allergen can cause a variety of symptoms from facial swelling to serious anaphylactic shock. In carrots, several proteins can cause a reaction. Everyone knows that cooking carrots renders them mushy. A little heat breaks down the carrot’s cell walls, and turns this crunchy vegetable into perfect baby food. Heat, in fact, makes many vegetables more palatable. In their natural state, plants have ways to avoid being eaten. These defense mechanisms are called secondary compounds and can be poisonous to the eater. Most common crop plants have long since lost these harmful effects, and cooking some toxic wild plants can break down their toxins, making them edible. When carrots are cooked, the potentially allergenic proteins within them unravel, rendering them safe from targeting by the immune system. According to a recent study in The Journal of Allergy and Clinical Immunology, these denatured carrot proteins can no longer bind to the posse of antibody scouts, and when antibodies cannot recognize allergens, a strong immune response does not occur. The same study found that cooked carrot protein can still activate a milder immune response that causes a less dangerous reaction. Some participants who ate cooked carrots did not swell up and suffer breathing problems, but did get rashes from the second type of immune response. Because of this, researchers recommended that people allergic to carrots avoid carrots in all forms, even though heating reduces risk. Don’t run to the crisper and dump those carrots just yet, though. Not many people have bonafide food allergies. The FDA estimates that only about 1.5 percent of adults and six percent of children have some kind of food allergy. Children outgrow most allergies, and allergic adults are typically only allergic to a few foods. Allergies to carrots are most common in Europe, where up to 25 percent of people with a food allergy need to avoid this orange root. Some experts say that food allergies develop in adults because of previous sensitivity to pollen; the patient may become allergic to a variety of plants that contain proteins similar to those found in the pollen. For example, celery, which is related to carrots, mugwort, certain spices and birch pollen all contain the same allergenic carrot proteins that some people just can’t stomach. I am also allergic to the humble carrot, both cooked and raw… none of my friends or family believed me. I ate a whole carrot and was rushed to hospital as i couldn’t breath – the pain in my chest and throat was unbearable. I then realised it was that, and its the same both cooked or raw. Very informative artical, thanks. I have had the same experience as That Girl. Someone who grew up on a farm where cantaloupes were raised told me it might be pesticide residues that were causing the problem. I never could eat celery until I bought organic, and now I buy all veggies organic. I have the itching mouth with numerous foods (avocados, melons, walnuts), but raw carrots give me large raised bumps on my lips. However, if I eat carrot salad, where the carrots are raw but covered with sour cream or yogurt, I don’t get the mouth reaction. My question is: Are the raw carrots I consume in carrot salad causing problems in my gut that I can’t feel? Am I getting an allergic or inflammatory response that I can’t sense, but that is still doing me harm? I also get a rash on my face when I have toasted/roasted nuts or toasted grains (like in fake coffee, or teas with roasted barley). What’s up with that? tODAY i HAD FOOD ALLERGY TESTING WITH MY DOC. I tested significantly positive for carrots and brazil nuts, and to a lesser extent to lettuce, and rye. I tested negative to apple, banana, cantaloupe. I have never had an immediate or noticeable allergic reaction from eating ANY food that I know of, but my doctor says each person has different allergies. To be on the safe side I am avoiding raw celery also since it has the same proteins as carrot. I have always had various allergies that mostly cause problems in the ears and respiratory system and in my adult years have developed eczema and ear infections from the eczema. Since we moved to France my daughter developed an allergy to raw tomatoes, lettuce, raw peas etc and a little itchiness in her mouth and ears from carrots and now apples. She takes antihistamine Zyrtec in drop form though tablets work just as well. She swells up big time when we have to rake up the mowed grass. She also suffers from excema. It is nonsense to suggest a super clean environment is responsible for food allergies, my kids were always crawling around in the dirt and now they are all very allergic to having a shower. We did move from London to live in the middle of the woods though ! For those asking whether salad dressings contain carrots. Some may. I started checking the ingredients after having a reaction when I knew I hadn’t consumed any carrots. Sure enough, the brand of lite ranch dressing I had consumed contained carrots. After checking other brands of lite ranch I discovered almost all of them have carrots. Then other bottled dressings started including them also. I don’t dare have any dressing but vinegar and oil that I put on myself at restaurants. Check labels! It seems since the drive to eliminate artificial food coloring from foods a lot of foods have pureed carrots or beets which I am also allergic to added for enhanced color. Sometimes the puree is used to thicken or enhance the mouth feel of some items I think. If you have noticed a sensitivity to a food please be careful. My reactions were mild at first, now at age 60 I finally had to go to an allergist because I was so congested I couldn’t talk most of the time, not to mention the pain in the chest and lack of breath an GI track symptoms from some foods. The allergists tests showed so many sensitivities and/or allegies I won’t even begin to name them, His comment was that my children who are exhibiting mild reactions at this time should pay attention and get preventative help early to prevent getting as bad as I am. Raw carrots and bananas affect me like Doug (#10) and Lauren (#37) above. I had tons of bananas as a kid. I started noticing this as a teenager. Cooked carrots are OK. Shredded carrots are OK too I think. I wonder if the drying of the vegetable helps in the same way the cooking does? Other significant known problems are avacado (and guacamole) and mountain cedar tree pollen which kills me every year. I have minor issues with cantaloupe and honeydew but they are still palatable and I am willing to eat them since the sweetness offsets the penalty of a small stomachache later. I need to investigate the chemical/pesticide aspect. I’m going to investigate the some organics and see if they cause the same issues. But I’m not holding my breath. I think it is the food. I am big time anti-drug. I won’t even take a headache pill. The ONE exception I make is Nasonex from mid-December thru January. That has literally given me my life back for those six weeks every year. Mountain cedar levels in Austin TX are crazy! I too found out the hard way that I was allergic to raw carrots. I would get a swollen lip and itchy mouth after I ate one. Then it was Tomato, then Banana, then Kiwi, then potato, then celery… the list is VERY long. I feel like a freak… it’s all very odd! At the onset of my food allergies I already knew I was allergic to Latex. However I did not know that many, and I DO mean MANY… fruits and veggies have very similar proteins as Latex. In short if you allergic to Latex, more often than not, if you eat these foods your body will mistake them for Latex proteins. You can Google “Latex food allergy” and you will discover that many people with these food allergy are also allergic to Latex. Latex is everywhere! All these foods everyone has listed above are pretty much the same foods I cannot have and are also on the list of foods to avoid if you have a Latex allergy. Google “Latex food allergy”… you may be very shocked at what you see. I am surprised how many people are allergic to carrots. I am allergic to milk and carrots. I have noticed over the last two years that I have the same reaction to pineapple juice, oranges (sometimes orange juice), and taro root. I get a cool sensation in my throat as soon as I start chewing. I then develop a weird tickle in my throat that causes me to cough for several minutes. The cool sensation goes down to my stomach, and I can feel it traveling down my body. My eyes then begin itching. Sometimes my nose starts running, not like when you are sick, but more like a dripping faucet. All these symptoms last usually a few minutes then go away. If they last I grap a benedryl. Although benedryl has started giving me headaches. I have asked my new doctor if this is normal. He says it probably is a reaction to what I am eating but it just sounds like seasonal allergies. I have year long allergies and I know the difference. This is not allergy like when dust or pet dander irritates me. It is an actual reaction that occurs with in minutes of eating specific foods. My last allergy test was at least 8 years ago. Out of the 350+ items from trees to food to animals they tested me for. I was allergic to the following items the worst. (pet dander, dog saliva, dust, pollen, mildew, mold on trees, dust, saw dust, evergreen trees, soft needle pine trees, cotton wood trees, cotton, cats, dogs, horse hair, carrots, and milk (allergic not lactose intolerant).I have developed new allergies since this test. I was beginning to think it is all in my head until I came across this posting. Thank all of you for your postings. It has helped me understand my allergies a little more by reading your stories. I have had a serious food allergy to carrots and apples since I was in high school. I use to be able to eat the them, when I was younger, but now there is no way. I have noticed since it is QUITE difficult to get soup/salads without carrots that if I accidently eat a cooked carrot, I have no serious reaction. I always thought that I had this super strange allergy. To the people who have problems with raw vegtables and grass cuttings see this link http://www.calgaryallergy.ca/Articles/English/Oral_Food_Allergy.htm. It’s reassuring to know that I am not alone in my allergies – to carrots (raw – itchy throat, ears; carrot juice – a trip to the ER) cantalope, bananas, and CORN!. As a midwestern girl, when husking corn in the summer for a cookout – I would get hives all over my arms. Tried to detassle as a teen – that was over in about 10 minutes. I took a bite of raw corn-on-the cob once – as bad a Rx as carrot juice! As with everyone else, cooking makes the allergy go away. Also – remember terrible allergies in the fall living in the midwest – it didn’t end when frost came (like I was told it would). Finally figured out it was all of the minute airborne particles from corn harvesting. No problems when I live in an area where no corn is grown. I am also allergic to any topical creams with Vit C ingredients – hurts, itches, burns. Over the last 5 years have had Rx to any undergarments with a “no-slip” lining, ex: latex. I get terrible blisters and scars. I saw mention of the relationship to Latex – could that be it? If I have surgery scheduled soon, should I tell them? One last thing – hadn’t been stung by a wasp since childhood – til last year; had swelling from my hand past my elbow. My doc said I was allergic – to carry an epipen. A month later – I was stung again, this time in my foot. In 2 minutes I was hives head-to-toe. Used my epipen and headed to ER per my doc’s instructions. they started an IV, started to give me IV benedryl – IMMEDIATE RIGOR in my hand and arm! They tried ped doses, but the same. I am allergic to benedryl now! Don’t know if only IV kind. Lastly – donated platelets for a family friend at our local blood center via aphoresis (they remove your blood, separate out the components, add anti-coag and give the red cells back.) This happens over and over for 90 minutes. The second time – I had terrible Rx to citrate anti-coag. I guess it is common – some suggest it is merely a Calcium deficiency that the citrate binds, but I don’t believe it. Took almost a week to recover. Research done post donation found it is more common than I thought. Idiots at the blood center didn’t know anything. My sister is allergic to regular carrots, however she can eat the organically grown varieties just fine. I would appreciate any responces in regards to this. This page is facinating to me, because I am allergic to many fresh fruits, veggies and nuts. They don’t bother me when they are cooked, but taste so much better (and are healthier) when raw. As a child, I remember eating carrots and have no memory of food allergies except apples. My allergies have increased tremendously, starting around age 14 (which is when I had my knee reconstructed). Now I am wondering if auto-immune disorder(s) have something to do with my ailments. It’s like my body goes into “fight” mode every time I eat fresh foods. Oddly enough, even chewing gum makes my throat itch like crazy!! But I know I chewed gum as a child and had no reaction. I am 50 now, and contrary to what the doctors said about my allergies, they have gotten worse; not better. A couple of years ago, I ate a delicious egg roll thingy at a restaurant, and I had a bad reaction to it; that’s when I discovered I am allergic to avacados. Also, I have eaten watermelon, honey dew melon and cantaloupe all my life and developed allergies to those things two years ago. Strawberries and bananas cause a little bit of itching too, although not as bad as apples and peaches. This is really super weird, and makes NO sense to me at all…Big, regular carrots make my throat itch so bad, eating them is out of the question. However, I can eat the little tiny baby (maybe organic?) carrots with no problem. People think I am crazy! I’m glad I found this forum. I am reading about foods that cause inflamation in the body. I am guilty of enjoying ALL the foods listed: milk products, eggs, alcohol, gluten, red meat, etc. and it’s just possible that if I eliminate them from my diet, my allergies and/or arthritis symptoms might improve. I am so addicted to these foods! I’m not sure HOW to break these addictions, but if I am able to do so (for like a 6-wk period) and if I DO see improvements, I will be sure to report the results here. I developed pollen allergies couple of years ago and from last year onwards, I feel itching of lips and throat when I eat raw carrots, apples, and almonds with skin on it. It seems to be getting worse. Organic carrots and apples without skin don’t cause itching. Help! Nowhere on here (or elsewhere on the web) have I found anyone saying that watermelon makes their gums raw/bleed. I posted elsewhere looking for others. I just discovered this. For the past several years I have been eating a ton of watermelon during the summer- often a 1/2 watermelon or more in a day. This past week I’ve discovered that after eating it, my gums are raw to the point of bleeding. At first I attributed it to pineapple, then new toothpaste. But my mouth was fine earlier today, and I just realized while eating the watermelon my mouth (tongue, gums, roof of mouth) was starting to burn/feel raw, and I tasted blood. Is this crazy or what? I also realized (after reading whar oral allery syndrome is) why I have had an odd burning sensation in my throat the past few years when I ate cantaloupe and (my favorite) orange-flesh honeydew. I cannot deal with more problems. Tell me it ain’t so!! Has anyone else experienced the raw/bloody mouth issue? It’s similar to when I eat pineapple, but with pineapple it makes sense, due to the acid. Watermelon? Wow was this article helpful. I am 30 years old and have been suffering from allergies to carrots and celery since I was 5 years old. All my life I have been complaining but dr’s just kept telling my mother that I was lying because I didn’t want to eat my vegetables. It is wonderful to finally be able to say that I am not alone and to discover what exactly it is that I am allergic to! I just watched a documentary this weekend “The Future of Food” by director Deborah Koons. It had a section in there about how the new ‘Genetically Engineered’ food crops were causing all kinds of new food allergies. It made me stop and think! Most times (But yet not every time) I eat raw carrots my lips burn like crazy. I do not get itchy or feel like my throat is closing uP, I don’t get any gastro symptoms. Do you think this is still an allergic reaction? Do I really need to stop eating them? I am not sure how long I have had this. I know I ate them as a kid with no problem but it has defintely been going on long enough that I didn’t even really take notice of it anymore. About 3 years ago as instant as over night I became allergic to RAW fruit, nuts and vegetables eg carrots, potatoes, any stone fruit such as apricot, peach, plums and apples even to the extent of the smell of some herb and flower. Cook to there is no reaction. I amanage this to the extreem of wearing gloves while preparing meals and make sure I dont touch my face while doing these tasks. I have no problems with strawberry, grapes if coated in a yoghurt, raw tomatoes and oranges are no problem either. I take Razine only when needed. All I have to watch is while gardening I dont get scratched by rose thorns, grasses insect bites I wear gloves and long sleeves. Oh I grow my own vegetables as well now but this did not change. Interesting about a week before the sever reaction started I woke up one morning with this real terrible itching in my ear, thought I had somthing in side there and even went to the Dr..but nothing was found. Have only had to have one trip to the medical centre in the early stages to get treatment. I do have an underlining condition of Hypo-thyroidism(sp)and on daily medication but have been for the last 15 years. Am concerned that medication I take for this is causing some reactions because if the ingredients used in the manufacturing of them. As about half an hour after taking my daily meds I notice itching round the eyes, am going to try a different brand. I have experienced a severe problem with carrots as well. It started when I was about 35 years of age. The irritation only appears on my face; however, it swells up, becomes incredibly red and then purple, becomes itchy and it burns. Then my skin feels as though it becomes dry and crispy and so very itchy that I can hardly contain myself from picking or scratching it off. The problem lasts for several months and up to two years. It is really challenging to socialize when my skin looks so terrible. I have tried antibiotics and medicated creams; however the results do not last. I am very much into health foods and attempt to eat raw and organic foods to the degree possible. My latest break-out began in early November and is just easing off now. I am hoping to be done with it within another week or two. At least this time I have not resorted to antibiotics as I know they cause severe problems with my liver. I have not experienced any life-threatening effects as some others have, for which I am truly grateful. I have been taking mega doses of enzymes and probiotics as well as product called Herb Cocktail. These have been working wonders for me. I have also done some work releasing emotional baggage that may have been in the way as well. I wish you are great success in managing and ridding yourselves of this problem. I’ve eaten raw and cooked carrots all my life (my mom always had a covered bowl of cut carrots in the fridge, and she’d simply put the bowl out on the table between meals). About eight-nine years ago, I began to get noticeably breathless while eating my lunch (which always used to include ‘baby carrots’). It took me a while to experiment, but eventually I discovered whenever I ate the baby carrots, I got breathless (with or without lunch). Now I’m curious as to whether this is due to the carrots themselves, or some preservative/fertilizer/pesticide included in the baby carrots. I have completely cured my allergies (food and pollens and hayfever) by following Dr Batmanghelidj’s recommendations in his books about water and salt. You might be interested to read his book “Eradicate Asthma Now – With Water: An ABC Guide to Curing Asthma, Allergies and Lupus”, available on Amazon.com and Amazon.co.uk All his books are excellent. I hope this will help you as it’s helped me and many thousands of others. It is so encouraging to see so many comments from other people who have the same problems as me (though I wouldn’t wish it on anyone). Like several other commenters, I became allergic or intolerant to almost all raw vegetables, tree nuts and many fruits when I was approximately 12 years old. They cause a variety of reactions including itching in the mouth & throat, swollen lips, skin rash and severe stabbing chest pains. Now that I’ve read your article and seen the comments, I believe that these allergies/intolerances are due to similarities with pollens, as I am allergic to most pollens and other environmental factors (as tested by an allergist). Thank you for your informative article. It is wonderful to see this article and all of the comments regarding allergic reactions to carrots. I too am severely allergic to carrots, celery, and certain apples. My first serious reaction took place in a public setting where I had to be rushed by ambulance to the hospital as they started an iv. It was the scariest day of my life to not be able to breath. I now keep liquid antihistamine on hand at all times in case I feel a reaction coming on. I was 22 the first time this happened and have been dealing with it for 8 years. People always react a little funny and suspicious when I tell them I’m allergic to carrots, it is strange. I’m glad to have read these stories so I know we’re not crazy but my daughter’s food allergy list seems to get longer as she gets older. My daughter is 8 yrs old now. When she was just over one year old, we found out she was allergic to peanuts, treenuts, eggs, beans and seeds. Now at age 8 she has suddenly developed an allergy (itchy throat/mouth) to carrots, apples (but not applesauce since it is cooked) strawberries and avocado. I’m fearing there will be more added to the list. We give her benedryl for the fruit allergies and it has gone away immediately and now we just avoid them. I’m wondering has anyone had any luck with seasonal allergy shots helping to alleviate the allergies to the fruits since they are related to the pollen allergies? Thanks for the article! I have had allergic reactions to carrots and celery my whole life. As a baby, my parents were hippy health food nuts and fed me cooked carrot baby food all the time. While you could hold me up with a raw carrot due to the instant allergic reaction I have, with cooked carrots I just get incredible stomach problems. My parents lived in a tiny town in the mountains and the only doctor advised them to just feed me sugar water until I was 2 because he couldn’t figure out where the stomach problems were coming from. Nobody thought a person could possibly be allergic to carrots! My allergy is always a conversation item at the table so I do tend to have fun with it, but 30 years later my parents still think I’m stubbornly trying to get out of eating my vegetables. Wow!!! Finally I’m not alone. I was stricken with my carrot allergy while at a park drinking a carrot bannana smoothie which was regular drink for me. My breathing became shallow, throat closed, lips and ears itched. I was 22 then and 20 years later I still cannot eat and sometimes not even touch a raw carrot. However, cooked carrots are no problem. What natural chemical unravels in a carrot when cooked. I also became allergic to canteloup and began to think it was the betacareotein that was the problem. With some apples removing the skin alleviates my reaction to it…Go figure! I had asthma and hay fever as a child..so how does that factor? My 12 year old daughter has hay fever and eczema and can eat very few raw veggies and absolutely no nuts or strawberries!! I just began juicing greens but can fnd very few juice recipes without carrots! Does anyone know of any sites or books that offer carrot free raw juice recipes? So glad to hear that I’m not crazy :) Like another poster, I have struggled with cantaloupe, watermelon, and even cucumbers my whole life: instant itchiness of the lips, throat, and inner ear. Bananas* produce itchiness and intense pain from behind my sternum. Just recently, this same feeling- lump in the throat, tightness in the chest, uneasy stomach- popped up when I ate a raw carrot. I get less itchiness but more overall discomfort. *Something I figured out about bananas: the allergen that bothers me is in fact located in the bottom tip of the nanner. If I open it like a monkey, and discard that tip, I get no allergies from the banana. I would also like to note that while some of these foods do not present immediate allergies, they severely provoke my IBS. Likewise, I think for me specifically, I think my allergenic protein is associated with the cell walls of the plants, or the fibrous part. Using a juicer, which removes the fibrous bits, I have zero problems with vegetables. I drink green veggie juice every day now and it has even significantly improved my digestion. I am 47 years old and had eaten all my life. About two years ago my mouth would itch a bit after a carrot or two. Last night, however, I ate about a dozen baby carrots and, while watching movies with my children, my eyes itched and watered and i was covered in hives. Thank you for publishing this site. About 3 months ago, while peeling carrots, my fingers started itching. When I had finished, I washed my hands and the itching went away about 90%. The same thing happened when peeling parsnips! Has anyone else had that problem? Now when I eat raw carrots I get the itchy throat, as I do with my tree allergy in the Spring. It was very interesting to read this article as I now realize I am not alone! But the parsnips??? Hey guys, I just wanted to leave my advice. Maybe you’re not actually allergic to the food itself, but the pesticides they are using on the foods. Maybe try to wash the fruits and vegetable’s better before you eat them or just plain switch to organic. It’s crazy the stuff they are putting on our food now a days, we just did an entire project on it and your symptoms are typical to what pesticides and chemicals on the foods cause. After I graduated from college, at 22yo, I seemingly out of nowhere developed raw food allergies — specifically to certain kinds of apples (my throat seemed to have almost completely closed once…I had tremendous difficulty breathing and I couldn’t even swallow a pill in an attempt to alleviate the reaction! )and raw potatoes, which I’ve never eaten but when I cut them for cooking I get terrible rashes, become itchy all over, and get a burning sensation in my eyes. I’m also allergic to soy milk, but not sure if that counts as a raw food allergy. I’m not too sure, based on the “case study” of my own life, that that hyper-cleanliness theory could be applied to me. I would never call myself hyper-clean. I never use products with anti-bacterial chemicals, as I’m aware of the dangers of these chemicals (I used to work in environmental health and became very aware of the dangers and toxicity of so-called “cleaning products”). And as a kid I loved jumping in big piles of mud and went to a big germ-ridden schools my entire life. In fact, my immune system seems to do a wonderful job most of the time: I RARELY get sick with common colds and viruses, even when I’m around people who are sick. I actually haven’t had a cold in almost two years. I do get horrible seasonal allergies every spring though–I’m allergic to pollen, some kinds of trees and grasses. I am one of these raw carrot allergic people. I’ve done a bunch of research since my recent diagnosis with a handful of allergies including this one. One question I cannot find an answer to: does dehydrating a carrot sufficiently heat it to denature the problematic proteins? I would be grateful for any links. I also invite you to read my article in the Washington Post on Dining Out with Food Allergies. I’m so glad I found this link. My son has told me in the past that raw carrots make his lips itch. Well I thought he was making it up in order to not have to eat his veggies. Yesterday we had raw carrots at the table w/ our lunch. He ate a few and after he ate them he said his lips were itchy. then he told me they felt weird like one was swollen. I looked at it and sure enough, one of his lips was swollen on one side as if he had a cold sore, only it wasn’t brite red. I said, enough carrots for you. I’m scared what could happen next as it’s not just itchy lips now. I am 33 years old and I was diagnosed with allergies to raw fruits and vegetables when I was about 20. I ate a carrot and my throat swelled up. Now I also have allergies to nuts, shellfish, wheat, soy and the list goes on! So I am basically allergic to everything. Doctors are fascinated by my case but no one has a solution. I remember when I was younger my throat and ears would feel itchy when I would eat raw fruits. My parents thought I was making things up. So I guess I went undiagnosed for years of my life. May be if I avoided these things earlier in life I wouldn’t have had all of these allergies now. Me too, for many years I had an intolerance to raw carrots but not cooked one. I can even drink vegetable juice which contain carrot. I am also allergic to birch pollen. Ate more raw carrot yesterday and ended-up at the local pharmacy for Benadryl. Not funny! I am allergic to celery and raw carrots. I can eat them cooked and when I told people that I think they thought I was making it up. Thank you for proving what I knew to be true for me. I am allergic to carrots, celery, cilantro, hazelnuts, sometimes canned tuna, and I have a latex allergy as well. My son, 20 yrs old is allergic to many foods including meats. The strange thing is that even though we have different allergies, we both have one odd symptom in common. When we, either of us eats something we are allergic to we get what my son describes as a “hot pain” sensation across the upper back. It is a strange sensation that lasts until a antihistamine is used. Does anyone know what this is? I’ve known that I have had an allergy to carrots for many years. I am also allergic to Birch pollen, almonds and some other raw vegetables and fruits. I came across this page because I was searching for more information after my reaction changed. In the past I had some itching in my mouth mainly. It wasn’t significant enough to go out of my way to avoid them though. Recently I have developed fairly severe throbbing chest and throat pain, but no itching. It’s strange for an allergy, but I’m sure that is what it is. It’s bad enough that I think I’ll make a point to avoid them.